Clear Lawn Landscaping - Keeping your landscape in peak condition all year long not only enhances your home's beauty and makes life easier to enjoy, but helps to safeguard your property investment. Clear Lawn believes that year-long landscape excellence requires both regular care and a proactive maintenance plan. Do you want a new patio, retaining wall, stone wall, hardscape, or planting? Perhaps you just need some basic landscaping maintenance such as weeding, brush clearing, leaf removal, mulching, or lawn mowing services. Or perhaps you're looking for the best landscaping and snow removal solution for your business. We service the Baltimore County and Harford County areas. Give us a call today at 410.937.2928 to learn how we may serve you. From new designs and professional installation to seasonal maintenance and mowings, Clear Lawn can make your property look fantastic! 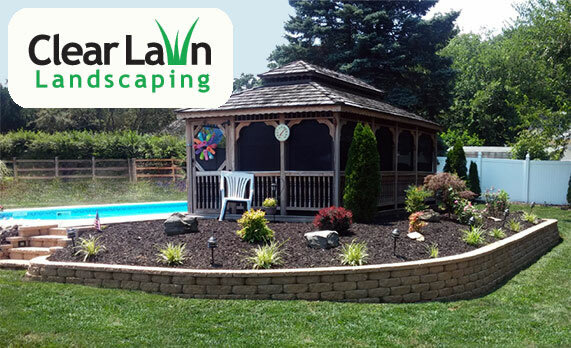 Harford County Landscaping Services: Hardscapes, Grass Cutting, Lawn Mowing, Weeding, Brush Clearing, Leaf Removal, Mulching, Planting, New Patios, Retaining Walls, Stone Walls, Snow Removal and more. Providing Landscaping, Lawn Care, and Snow Removal services to the Baltimore and Harford County areas.